With the industry moving towards free-to-play as standard, some might balk at the idea of playing a subscription MMO, but Final Fantasy XIV has always been very good about letting you know where your subscription money is going in the form of massive episodic updates every few months, accompanied with trailers that would herald a full expansion in any other MMO. The latest – Patch 4.1, entitled The Legend Returns – promises a dramatic extension to the main story arc and one very nostalgic surprise for long-term series fans. Final Fantasy XIV is undoubtedly one of the top ten MMOs on PC today. Here’s the other nine. The focus of Patch 4.1 is the continuation of the main story. As any Final Fantasy XIV regular will tell you, nothing is ever simple or clean-cut, and even happy endings have plenty of opportunity to turn sour. Despite the liberation of Ala Mhigo over the course of the Stormblood expansion, political forces have been set in motion, and there are many groups with ambitions for the land. For myself, the biggest draw of this update is the return to Ivalice, the world of Final Fantasy Tactics. Cleverly framed as an epic stage production in the service of a travelling theater company, players will retell part of the saga in the form of a 24-man Alliance Raid Dungeon. Square-Enix have even brought back some of the original Tactics developers, including director Yasumi Matsuno, to ensure that the tale is accurately retold. Drama seems to be order of the day in The Legend Returns, with the Shinryu’s Domain boss battle getting a retelling in the form of a Minstrel’s Ballad; a somewhat embellished retelling of your past victory, which explains why this version of the fight is significantly harder than you might remember. Final Fantasy XIV’s clever framing of higher difficulty versions of old content is never short of amusing. On a less dramatic note, there’s a new dungeon – The Drowned City Of Skalla – being added to the mix, a new player housing region opening its gates, a new MOBA-esque PvP mode (coming a little later in Patch 4.15), and more comic relief coming with the return of everyone’s favourite bumbling detective/man-of-mystery, Hildibrand. There’s more beyond that, including a return to the Binding Coil of Bahamut, but the full details have yet to be announced. 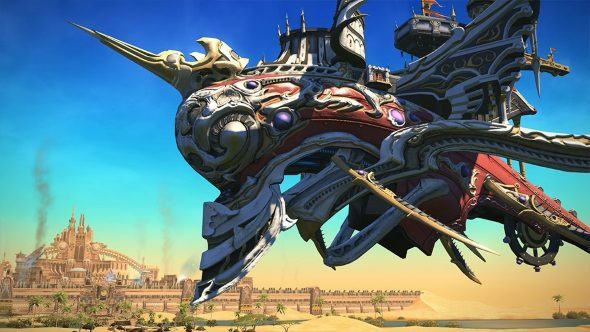 Final Fantasy XIV Patch 4.1 is due for release on October 10th, and will require the player to own the original game as well as both expansions – Heavensward and Stormblood – and have completed them both.